Shop & Save with JBF! Spring dates are here- THURSDAY APRIL 11 (presale) - SUNDAY APRIL 14. Check out the schedule for shopping times. Come and shop for Spring/Summer kids' items, just in time for the warmer weather! 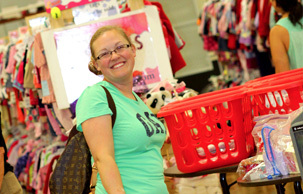 Best place for bargain shopping for all you need for kids. Bring your friends & families and hurry. Premium items sell out fast! We are happy to accept cash, debit cards, Visa, Mastercard or Discover credit cards for payment. 50% Off Presale-must have a wristband to shop, check in at the registers for wristband. FREE parking available at the location! Look for the HUGE JBF banner for easy-spotting! Check out images from our last sale in Fall 2018. Take note and come shop at JBF Schaumburg Spring sale in April. I like the fact that for the most part it is pretty organized. I love that I can sell items I no longer need and also get some new items as well. I save a lot of money every year buying my daughter o pay clothes from the sale. This year in total between 2 sales I spent about $150 but I have made $300 from selling her gently used items. So I made money and got her some new clothes and also I donated our items that did not sell so that’s 3 birds with 1 stone! It’s a win-win for everyone! I was surprised how easy the tagging was and liked seeing the items that sold each day online. My check came very quickly after the sale. I will definitely do this sale again! Sally is a great organizer as she personally cares about the consignors and shoppers who come to the event and goes out of her way to accommodate their needs. Want to turn your CLUTTER into CASH? Ask us how!